The world recognized Russian chocolate as one of easy souvenir to bring home, besides Matryoshka, fur accessories, amber jewelry and other Best Selling Items In Russia. There is a favorite Russian well-recognized chocolate brand that adored by natives and also foreigners. It is a simple souvenir to have a great gastronomic impression after traveling to Russia and bring these chocolates as a tasty souvenir. The world becomes smaller as the growing number of tourist and travelers that come to visit Russia. Especially when you stumble upon great tasty snack that you just got to take home. Here are some of the Russian chocolate to bring as a souvenir. European countries are famous for their reputation as a chocolate manufacturer and Russia is among the finest and the largest of all. Russia varieties and range from the most affordable to the very luxurious and expensive might seems to be a surprise. One of the Most Famous Chocolate In Russia of all time. Alenka chocolate is fantastic chocolate from dark chocolate to other varieties that bring joy since the Soviet era. The unique baby girl in Russian scarf as the chocolate covers has remained as a sweet reminder of authentic Russian with the same taste and cover years ago. Вернисаж, that has an authentic Russian wrapper from famous cities to monument and nature icon of Russia. The wrapping of the bars always has different background color with a picture of a person in the middle that makes a fun souvenir. Особый, dark chocolate as a symbol of bitter with a hint of salt. The unique taste is elevated with the brown and red polka dots wrappers. A rather conventional taste with unique retro cover. Тройка, and of course a chocolate variant will never be complete without some milk chocolate that sweetens things a bit and make a very tasty souvenir. Other milk varieties include adding rice which even sounds more appealing. Boxes of Sweets is the absolute best quality and taste. That comes in a unique and glamorous box fit for indulgence and you love ones. The box contains tiny unique chocolate with a various flavor that leans towards high-end quality products. The ultimate chocolate praline stands out as the perfect chocolate souvenir of them. Some of the Russian famous choco pralines include Мишка на Севере and Сказки Перро- Конфеты that as a nice small feature. The pralines candies with soft chocolate coating enhance by filling among the layers of wafers create a tasty combination. Moreover, these small treats also come with the city view of St. Petersburg and Leningradskiye as a great souvenir choice. 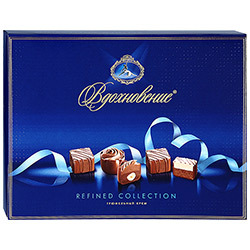 Is the famous blue Russian chocolate brand is a must Things You Need To Taste In Russia that come with luxurious packaging. The authentic Russian recipe all the way from 1976 gains love and affection as the ultimate romantic souvenirs. The chocolate balls come with a unique shape and filling as a pop of sweet surprise in a box. It is known by millions of consumers as Russia high-quality chocolate souvenir with great taste. The famous dark chocolate bar offers a high-quality mixture of chocolate made with cocoa beans and butter. The famous “Babaev” chocolate brand began a long time ago as far as 200 years from a tiny confectionery shop in the heart of Moscow. Like most Russian Chocolate brand it all start as a small home-based industry that evolves into a huge factory. Alexei Ivanovich Abrikosov, a very famous Moscow businessman take the simple homey industry into international scale business. This brand is a perfect fit for souvenir due to its simple choco wrapper and its bitter taste that has become the trademark of Russian chocolate. Their variant highlight how many cocoa or chocolate percentages in the bar. You can have mild bitter chocolate with 50 percent of coca or even up to 75 percent. The Russian government even award the Elite dark chocolate, that contains 75% cocoa with a diploma and a gold medal “For high-quality products” in the “The Best 100 Goods of Russia 2011 contest″ which gain its popularity as the ultimate chocolate souvenirs. The famous brand to this amazingly unique chocolate includes the Chocolate prince or the Baltiyskiy. The brand comes highly recommended in the wafer cake categories. The layers of wafer come together nicely with the right amount of creams. It becomes the right combination of bitter, sweet and savory at the same time. The chocolate marshmallows apple delights is a great souvenir for the traveler that has to spend some times in Russia. The unique jelly base from authentic Russian agar-agar (sea algae) is a light healthy sweet treat. The dairy products with very low calories are the fans of any sweet tooth out there that do not want to over consuming it. Sadly the Zefir itself is very moist and fragile. Therefore, even with a cute box packaging, it is not a suitable long trip chocolate souvenir. Bring Back Childhood Nostalgia With Legendary Soviet Candies and chocolate as a sweets souvenirs for the traveler that will make a good present. All famous Russian chocolate either have bitter cocoa flavour or very nutty combination of almond, chesnuts and many other crushed ingredient.